Father's Day this year was a good one -I loved it, and I'm not even a father! It was so nice to spend the day with some great dads and eat some great food and get a great nap:) I'm so grateful that I not only lucked out with a wonderful husband, but he's blown my expectations away as he has taken on the role of "daddy" (and those expectations were already pretty high). Prime example: the above photo. 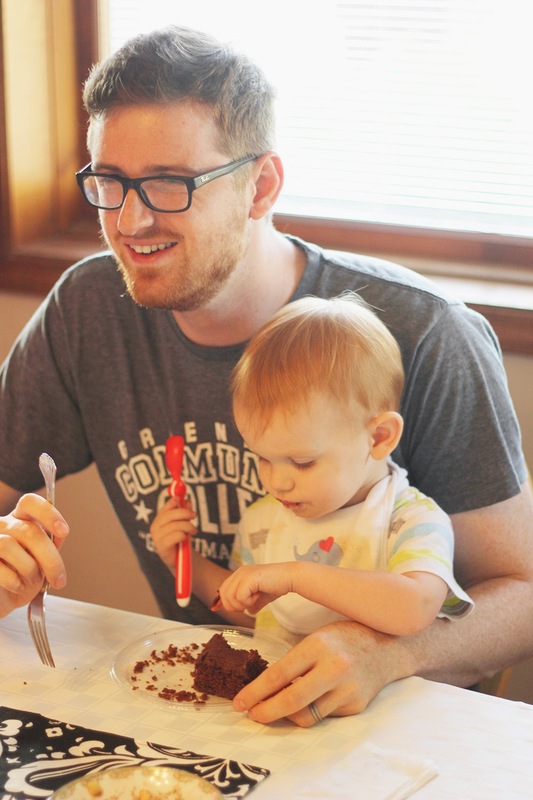 It's his day and his cake, but he's sharing it with little Fox:) Thanks for being such an amazing, fun, happy, thoughtful, patient, hardworking dad, Camaron! Oh, and you may have noticed, the blog just got a new look! Lucky you for being one of the first to grace its presence. 10 points to whoever finds the most glitches. Ready, set, go!